February's birthstone is the regal amethyst. Amethyst lore says this beautiful gemstone is cherished for its healing properties. Amethyst gems are mined around the world from Arizona in the United States, to Bolivia, Brazil and Zambia. Amethyst is a type of quartz a very durable and beautiful gem. There is a large amethyst weighing 164 pounds on display in the GIA museum. Regardless of whether it is your birthstone or not, amethyst is a delightful gemstone to be used in any type of jewelry. Amethyst has been my gemstone of choice for years, using it in rings, pendants, earrings, bracelets and necklaces. This gemstone is very durable and truly makes a great fashion statement. 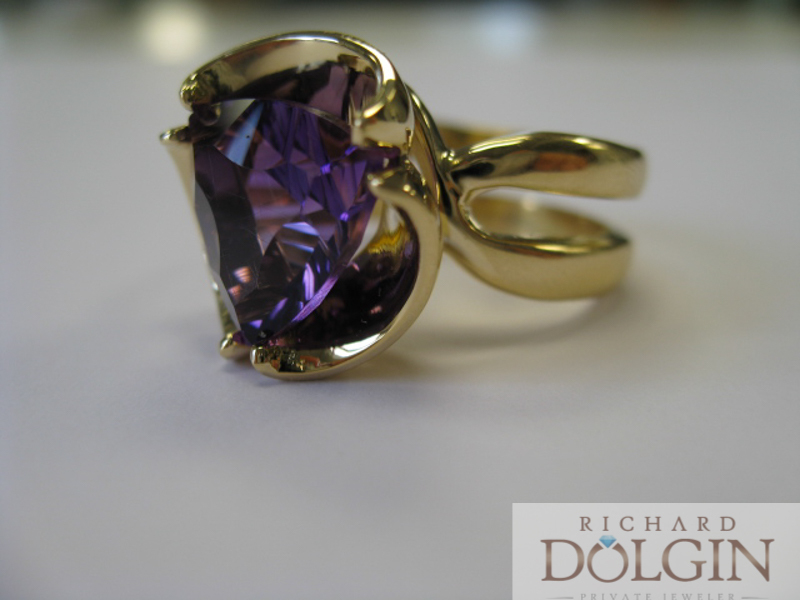 Amethyst can come in all shades of purple, from a very light lilac to a deep vivid purple. It is fun to design jewelry sets using amethyst, having matching earrings, ring and pendant. These sets make a wonderful fashion statement and can be worn with almost any outfit. One of my favorite jewelry sets is this floral inspired set Marsha and I designed a few years ago. We have made this set in white and yellow gold and it truly makes a beautiful fashion statement. It is easy to wear with a dressy outfit or jeans. We had the center stones specially cut to a trillion shape from some gem quality deep purple amethyst with beautiful purple hues irradiating through the stone. The setting is inspired by one of our passions - African violets. Not only would amethyst make a great birthday gift for February birthdays, but it also makes a great gift for any special occasion, especially Valentine's Day. If your loved one has a favorite gemstone shape and loves purple, stop in and we can custom design some very artful jewelry using this beautiful purple gemstone. Here is a gallery of some of the pieces we have made in the past and have on hand to purchase immediately. February, the month of the amethyst birthstone and Valentine's love. 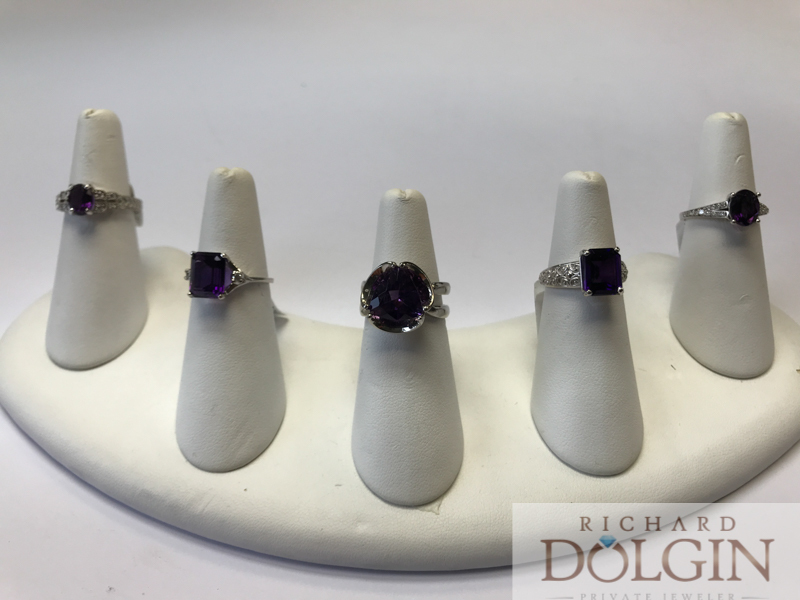 Stop in to Richard Dolgin Private Jeweler to pick out a beautiful piece of jewelry featuring a glorious purple center gemstone.